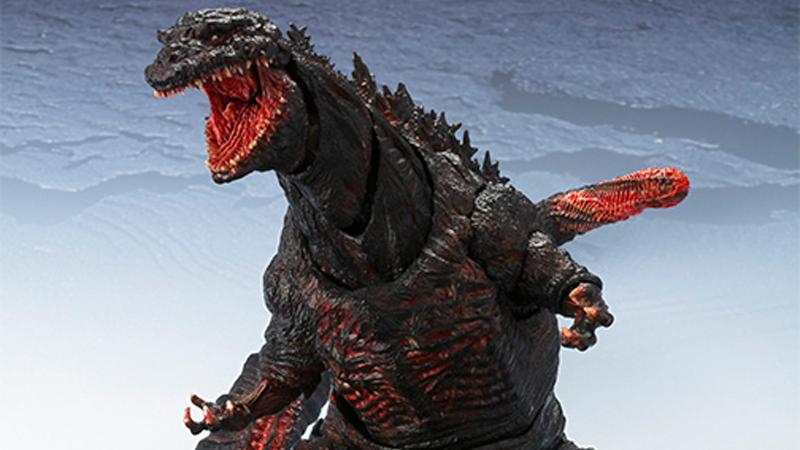 We’ve seen the gnarly-looking star of Shin Godzilla stomping about in the trailer and stills already, but this new Figuarts action figure of the monstrous design really gives us our best look yet at the new King of Kaiju. It also helps that it’s a fantastic-looking toy, too. Part of Tamashii Nations’s ‘Monsterarts’ spin-off of its highly articulated Figuarts line, Shin Godzilla comes in at seven inches tall, and has a ton of articulation, from its creepily wide-opening jaw, to its gnarled and bloated appendages, all the way through to its ridiculously lengthy tail—so you can pose it thrashing wildly, just like it does in the movie. I was alarmed at just how freaky-looking this new Godzilla design was when it first emerged, but I’ve fallen in love with it the more we’ve seen of Shin Godzilla. It looks downright messed up, and there’s something intriguingly scary about that. We’ve had so many Godzilla movies over the years, he’d almost become cute. Shin Godzilla is anything but cute. It’s also finally great to see it “cleanly,” rather in the context of the film, to get a good look at all the little details—from the feet to the traditional spines, all the way to that raw-looking tail. There’ve been rumors floating around that the tail is actually home to some weird alien parasite driving Godzilla into his rampage, and it kinda makes sense looking how messed up and rotten it all looks. If you want a lil’ Shin Godzilla of your very own, this toy is out in Japan later this year, and it’ll cost you a pretty sizable 12,960 Yen (about $126).